When talking about eye dominance you will sometimes hear people refer to the master eye or the power eye. Either way, know that we are talking about the same thing. On this page we will demonstrate how to test yourself and determine what eye is your dominant eye. With the Miles test note that there are two different ways you can evaluate your eyes. The results will be the same. If there is any uncertainty about the results then do all of the self testing methods mentioned below. Select a small object at least 10 feet in front of you and look at it with both eyes through the hole in your hands. While remaining focused on the object close one eye and take note of what happens then open the eye. Now close the opposite eye and take note of what happens to the object. Now slowly draw your hand closer to you. When you have drawn your hands back to your face the view window will be placed over one eye or the other. This is your dominate eye. Extend your arm out in front of you. With both eyes open raise your thumb or align your index finger on a distant object. Close the left eye and observe the location of the object. Now open the left eye and close the right eye and observe the location of the object. It is likely that when you closed one eye or the other, the object disappeared or appeared to move to one side or the other. It is also likely that when you closed the opposite eye, the object remained stationary in the view window you created with your hands. The eye that kept the object stationary in the view window is your dominant eye. If you performed this simple test and the object did not appear to move when you closed one eye or the other then you are among the rare individuals who have central vision. If that is the case then you are likely to be a very effective archer regardless of which hand you shoot with. 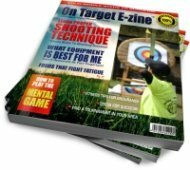 Should I Shoot With Both Eyes Open? Shooting with both eyes open will work for some archers but for others it is not the best idea. For example, roughly 70% of men have an eye dominance that matches their handedness (right eye dominant, right hand dominant and vice versa). For those people it is likely that they can effectively shoot with both eyes open. If you are cross dominant (e.g. right handed and left eye dominant) then it may be difficult for you to distinguish the actual target location due to the parallax effect. 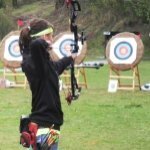 If you are cross dominant and you are not sure if you should shoot a left handed or a right handed bow then go here to learn more. Have A Question About Determining Your Eye Dominance? This is a great test and I had not realized before that one eye or the other would effect my aim. Thank you for the great help. When whichever eye I close the object moves, so which eye is my dominant? Thank you again.